The idea behind a living wage is very simple: that a person should be paid enough to live decently and to adequately provide for their family. At its heart is an ethical argument for preventing in-work poverty and ensuring workers are not exploited through low wages. The highest rate of the statutory national minimum wage is currently £7.83 an hour. This has been proven to be too little for a person to make ends meet for themselves and their family. The voluntary national living wage rate is now £9 an hour, outside of London. The voluntary London living wage is now £10.55 an hour. Some 6.3 million people, 23% of the working population, earn less than a living wage. The taxpayer is subsidising poverty wages to the tune of £3.6bn a year, including £1.1bn in means-tested benefits. 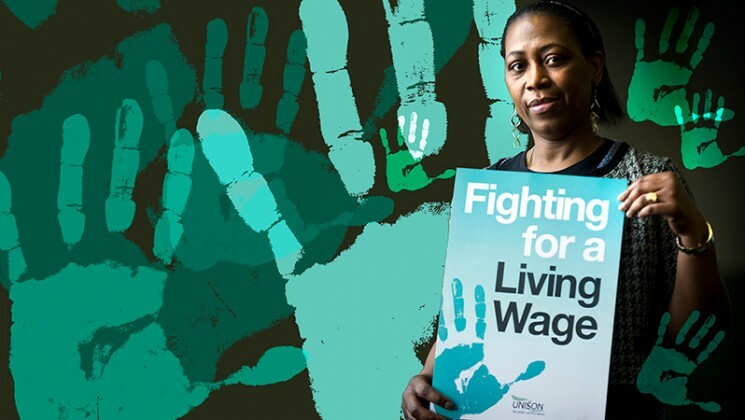 We won the minimum wage – I want to add a living wage to the list of the union’s achievements. Helen works as a homecare worker for a large private company. She is employed on a zero hours contract. Her pay rate is the same as the national minimum wage and she has to support herself and her two children. Well it was a struggle to get out of bed today, day 15 without a break. I have to work extra to be able to afford essential repairs to my car, without the car I am limited to the amount of work I can do and areas would need to be restricted meaning less money to live on. Yet there is no petrol allowance or consideration to the increase in my insurance. My first call today is to assist a lady out of bed; it’s a 2 person call as she is very disabled. When I arrived there was an awful smell, I then noticed that her commode had not been emptied the night before and had been placed right next to her bed, how she managed to sleep is a wonder! We have 1 hour to assist but once she is safely seated I left the other carer to assist with her breakfast and tidying up as my next call often takes much more time than is allocated. Mrs M is fast asleep when I arrive, she likes a lie in but they regularly give her a 9am call so that we are able to fit more people in. I offer her a drink to entice her to get up this alone can take 20 mins today I’m lucky, 10 minutes and she is ready to go into bathroom. Mrs M has difficulty with her bowels so I leave her alone to use the toilet. 15 minutes later she is ready to get washed. As this is a ½ hour call I am left with 5 minutes to get her washed, dressed, meds prompted and make her breakfast. I have reported my concerns but social services say this is an adequate time scale – I disagree! I would never leave a client because their time has elapsed so I carry out all tasks as required – if a little rushed and leave 20 minutes late. Luckily my next client lives with a family member but as it is several miles away I arrive almost ½ an hour late. Today is her trip to the daycentre so her family have given her breakfast and started to get her dressed. As most of the work was carried out before I arrived I have condensed a 45 minute call into 20 minutes giving me time to get to my next call a simple medication prompt. Mrs C has dementia and often requires more assistance that is currently in place. I offer her breakfast and a cup of tea and check the house is safe. She has no family nearby and suffers from agoraphobia so the 3 calls a day she receives are her only social contact. I make an effort to sit and chat while she has her breakfast and reading through her file I notice that yesterday evening the carer was here for only 10 minutes. As we are very short staffed in a different area I have been given some new calls to cover 15 miles away this trip alone takes 25 minutes. So far today I have spent 1 hour travelling and its only lunch time, that’s 1 hour of my day at work that I don’t get paid for! I am running behind so after preparing a microwave meal and a cup of tea for the service user I run out without having time to have a conversation, it makes me feel so guilty but there is always someone else waiting. By the time I arrive at my next call it is 1.45 and the lady is very unhappy at my time keeping, I apologise and explain how far I have come but she very angry with me. I can feel my head pounding knowing that I am going to be late for a sit I have to do next. I sit with the lady while her daughter goes shopping but as I am ½ an hour late she will come back ½ an hour later which means I have childcare issues! Again! I phone around and get my 76 year old neighbour to agree to sit with my children so that my husband can go to work. It’s nice to get home and see the kids they were in bed when I left, but I haven’t seen my husband at all. Unpaid travel time: 1 hour 45 minutes. 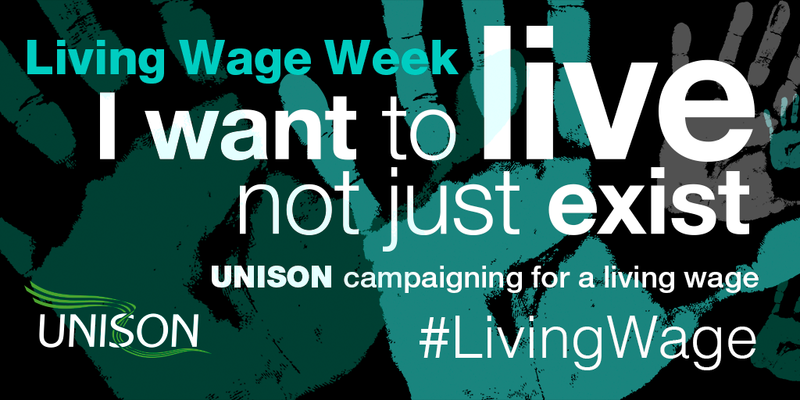 UNISON campaigning for a Living Wage poster to download and print out. 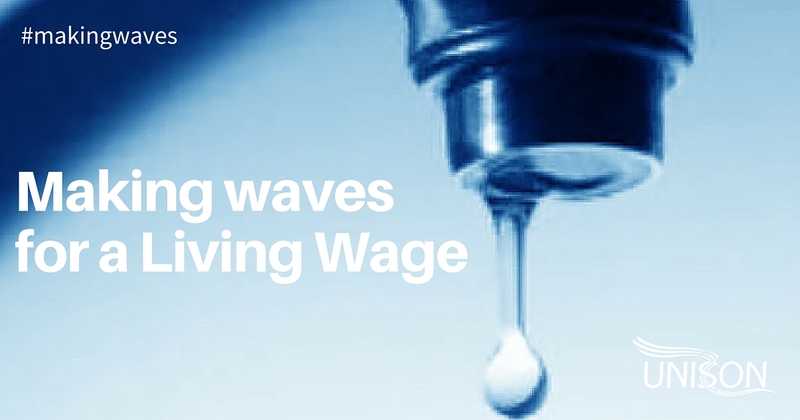 The Living Wage: A briefing and plan for implementation in Church of England schools. A4 12 pages. Available as a PDF only. 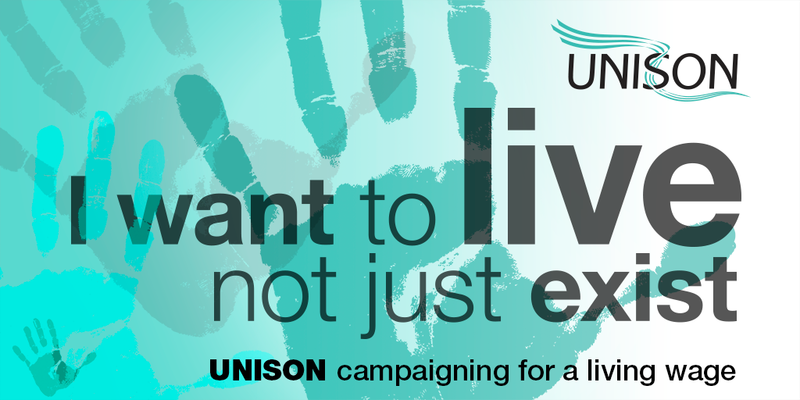 Leaflet to help members campaign for the Living Wage in their school. 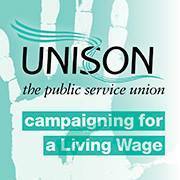 Round sticker, green and white, with UNISON logo and text that says: UNISON campaigning for a Living Wage. 15 stickers per sheet. Please order in number of sheets required and not individual stickers. A limit of 50 sheets (750 stickers) has been placed on this item. For sharing on social media – Facebook, twitter, etc. 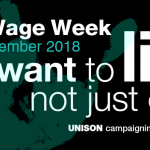 A4, Word template to be used for for Living Wage campaign. A5 leaflet for recruiting workers in social and residential care. 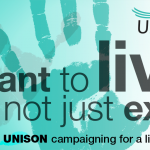 Puts the case for the Living Wage for all care workers and how to start campaigning to achieve it. Message: Speaking up for a Living Wage.